Arlena Stuart Marshall is a beautiful woman, and she flares up passionate emotions wherever she goes. Men adore her, or at the very least, admire her beauty. Women despise her. It’s not the most harmonious atmosphere she brings with her to the Jolly Roger Hotel, where the great Hercule Poirot is coincidentally staying. She seems to have her sight set on young Patrick Redfern, recently married to Christine, and this relationship is tearing apart the young marriage. Someone at last decides to stop Arlena for good, by strangling her at Pixy Cove. Hercule Poirot is asked by the local police to help out with the investigation. And thus, he begins to question everyone. There’s no shortage of suspects, he soon discovers: there’s Arlena’s husband Kenneth and his daughter Linda; there’s the dressmaker Rosamund Darnley, something of a childhood sweetheart of Kenneth Marshall’s; Patrick and Christine Redfern, whose marriage was being threatened; Revered Stephen Lane, a religious fanatic convinced Arlena was the incarnation of evil… and there’s plenty more where that came from! From a pure plot perspective, this is one of Agatha Christie’s finest triumphs. She provides readers with scrupulously fair, yet very tricky, clues, double clues, and red herrings. Everything adds up in the end and fits the pattern that Hercule Poirot has deduced. You can look forward to such odd elements as a bottle thrown out of a window and a bath that nobody will admit to having taken. 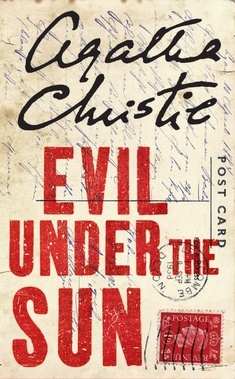 At the same time, this manages to be one of Christie’s best books in terms of characters. In particular, she does a great job with the character of young Linda Marshall. She is an awkward child, still at that stage between childhood and adulthood in terms of maturity—she wants to be treated more like an adult yet her thinking in many ways is still very childlike. She isn’t a particularly attractive child and her mother-in-law’s finished grace and poise does nothing but make her feel even more insecure. It’s a very convincing portrayal of an insecure, shy young girl. The identity of the murderer is one of Christie’s most chilling. X (who, for now, I will pretend is male) proves himself to be so cold-hearted and brutal. The motive is purely selfish and X’s way of attaining his goals is wholly unscrupulous. You’re glad to see X caught in the end—and, in fact, Hercule Poirot manages to provoke X until he loses his head and gives himself away. Slowly, Hercule Poirot nodded his head. But as we find out in the end, Poirot is not at all agreeing with Stephen Lane’s summation of Arlena’s character. He has a very different interpretation from anyone else’s. Throughout the book, everyone chastises the late Arlena: beautiful, yes, but what a devil! What an evil woman! So heartless, so ruthless! When a note is found from a lover, everyone emphasizes just how love-struck the poor fellow is by her, but Poirot notices something else. At the finale, he reveals just what kind of person Arlena really was, and through this, I think Christie was criticizing the mental attitude that it’s always the woman’s fault when, say, a marriage is ruined. It has potential for being one of Christie’s most powerful and relentless moments… but there’s a small problem with it. Christie is so concerned with giving Arlena dialogue that can be interpreted a few ways so that, ultimately, Arlena comes across as a rather empty-headed airhead. And it’s hard to feel much sympathy for someone so shallow. It’s all because of a few scenes of dialogue that we could have easily lost, without which Arlena would seem far more human. But that is nothing more than a minor problem in the grand scheme of things. After all, this isn’t feminist literature, it’s a mystery. I didn’t open this book expecting feminist insight on the 1930s/1940s and how this affected the war effort—I came for a good story. The book was published in 1941, but there’s no mention of the war (at least not as far as I can recall). That doesn’t mean everything is rosy and cheery and perfect with the world—in fact, it’s a rather sombre story of nothing more nor less than pure, concentrated evil occurring in an apparently idyllic place. 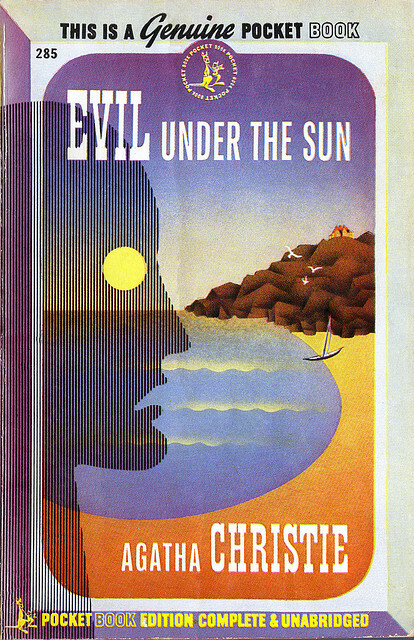 Overall, Evil Under the Sun is one of Agatha Christie’s masterpieces. 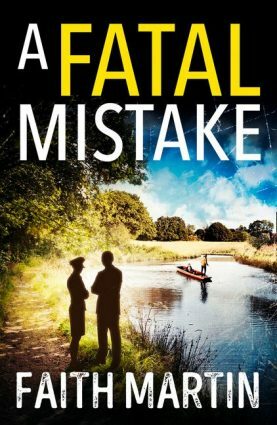 It’s a heck of a read with a wonderful plot and excellent characters, even if the victim ultimately comes across as rather empty-headed. 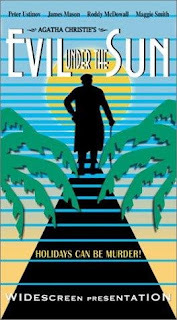 It delicately treads that line between ingenuity and over-ingenuity and manages to stay on the side of ingenuity in a mad literary equivalent of a sabre dance, giving readers various clues that seem to make no sense until Poirot explains all. This book ably demonstrates Agatha Christie’s universal appeal throughout time. This book was read as part of my 2012 Vintage Mystery Reading Challenge, under the theme of “Devil Take the Hindmost”. Given Christie's experiences with adultery, I would definitely think she would feel that the husband is mostly to blame. The spouse is the one who took the vow, not the 3rd party. I've read EVIL UNDER THE SUN many times and always enjoy it. I enjoyed reading your review as well, Patrick. This is definitely one of my Top Ten Christie books. It is, dare I say it? Brilliant. I believe Dame Agatha first tried out this plot in the short story TRIANGLE AT RHODES with a very definite twist from the eventual EVIL UNDER THE SUN. Nice review– I always found Poirot's comments on Arlena Marshall to be very interesting in their seeming contradictions. Early in the book, he implies that Arlena had neither goodness nor brains, and therefore does not "count." In the denouement, he explains that she was quintessentially a victim, forever attracted to men without earning lasting love in return, and easy prey for those who would take advantage of her. Interesting, how one character claims to be the object of pity early in the book, while Arlena turns out to be considered pitiful by both Poirot and her husband at the end. Have you played the computer game version? I was struck by the pacing– the murder doesn't occur until two-thirds of the way through the game, so it really throws off the investigative feel. Also there are Nazis with cannons. Yes, but I think this point is more pronounced than in other tales. I can't recall another story of AC's at the moment where she so clearly criticized the attitude of blaming the woman. Woman character are often far stronger than their male counterparts (it even applies here with the Redferns) but Arlena is a very weak, pitiful character, so to have Christie turn the tables with that in mind is very interesting indeed! Yes, TRIANGLE AT RHODES has an almost identical set-up but a very, very different resolution! I liked the Ustinov movie as well, but I wouldn't have wanted Suchet in it. It took him time to figure out the accent and all, and he's also got the honour of being the most hilariously awful Japp of all-time! I got very frustrated with the game, which was full of technical glitches that made the computer freeze up. In the end, I never finished it. I hoped to find it on the Wii (I saw it one time and passed it up to my regret), but the PC version is dreadful! It can be used in anger management courses as the final test. I'm reminded of a running joke on the Internet on computer reviews: "But will it run Crysis?" Replace "Crysis" with "Evil Under the Sun" and you've basically lost none of the question's meaning. This is also on my personal top ten of Christie's books. I like the joke uttered by one of the female characters when she first meets Poirot: "I thought you were dead." Christie had just written CURTAIN and had it locked away, but no one would ever get the joke for another 30 plus years. The bits with Linda trying to do away with her stepmother via witchcraft are a nice touch, too. It's like something out of a Gladys Mitchell novel. 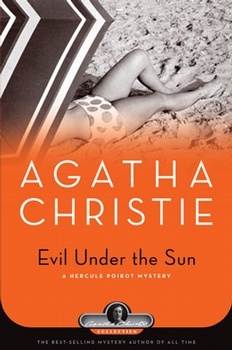 It's been some time since I read this book (as is the case with so many of her stories), but this is definitely one of my favorite Hercule Poirot cases. However, I remember thinking, after having read this book back-to-back with Death on the Nile, how much, at the core of it, this one resembled the former – as if she took its skeleton plot and build a completely different structure around it. But keep in mind that these are fuzzy observations from several years ago. Was it Linda who read Carr's The Burning Court in this book? Maybe that put some ideas in her head! 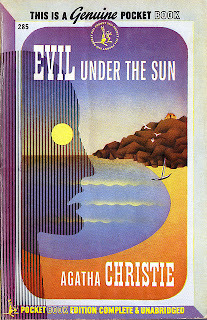 Excellent review Patrick, though like TomCat, for me the book did suffer a little bit because I'd already read DEATH ON THE NILE, and with all the best will in the world (and without getting too spoilery), it really is pretty much the same plot, same sort of alibi, same sort of villain, same sort of victim. I agree. One of her absolute best with her twisting the supposed love triangle into a completely different pattern. But feminist only up to a point, Patrick. I fear it's another one of those novels where a highly successful woman who loves her job "happily" gives it all up to marry the man she has loved since for ever. What they are going to live on is anybody's guess as the man in question is clearly a decent chap but no great shakes at business (or anything else). Actually, let me amend that. He is very decent, upright, stiff upper lip etc etc and will not divorce his wife even though she is a nuisance and he has long ago ceased to love her but his decency etc etc does not stop him from cheerfully sacrificing his teenage daughter to his code of honour. Actually I've always thought that it's well on the other side of the "over-ingenious" line. Death on the Nile (which as the other comments have pointed out has an identical core structure) is maybe too simple, judged purely as a mystery. 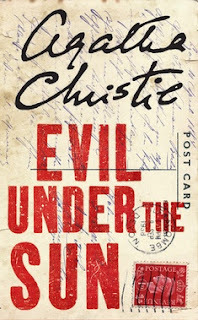 Evil Under The Sun makes the mystery harder to solve in comparison with Nile both my making the other suspects more viable and by making the killers scheme more complicated. But I can't help but feel that it's now TOO complicated. The plan in Death on the Nile seems risky but plausible. The one in Evil Under the Sun just seems nuts. So many things could have gone wrong. And what if I disagree with Christie's opinions on sunbathers? The whole thing collapses. I agree about the computer game. Digitised tedium. The frequent crashes were a good way of reminding me I ought to be doing something constructive. I've always had difficulty with this novel. For years, I tried to convince myself that I really enjoyed it. But I didn't. Christie's portrayal of Arlena Marshall struck me as rather pathetic. Lame. And she didn't seem like the type who would vacation at a local English resort. I've always felt that a more glamorous and foreign location was more to her taste.